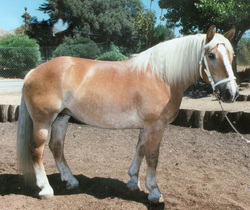 “BABE” an American bred Belgian mare was 11 years old when she came to Valley View in October 2000. 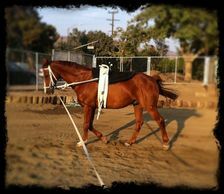 She loves her vaulters and traveling to Rancho Rio Verde in Long Beach every Monday for lessons. She has the strongest work ethic of any horse we have ever had and really knows that she is a part of changing people’s lives! “Elle”, an Andalusian mare born in the U.S. in 1996, came to Valley View in February of 2001. 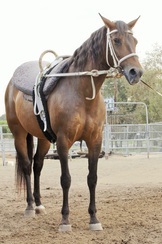 She is a 15.3 hands Trot Vaulting Horse that you can see happily trotting at practices. Elle has carried many Trot vaulters at Local Vaulting Competitions and AVA National Championships. Elle has been with VVV since 1995. “Waldmeister” is a Hanoverian gelding born in Germany who came to the US early in his life. 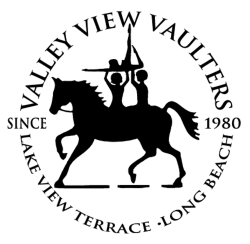 In June 2001, at the age of 7, Waldmeister came to Valley View Vaulters. He soon learned a love of vaulting and all his vaulters. He has carried his Vaulters to many competitions where they have won many 1st Place ribbons at local and regional competitions, and National Championships. Known to all as "BEN", a Shire/Oldenburg gelding, was 13 years old when he arrived here from the Root Farm, located in New York in 2013. 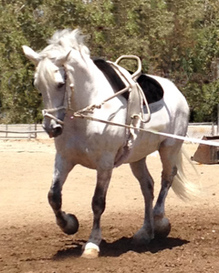 "Ben" is a wonderful vaulting horse and really enjoys his vaulting practices and competitions. He can be seen carrying his vaulters of all abilities, including Special Needs, Walk, Trot and Canter vaulters at practice each week and also at competitions. R.F. Bentley is currently #1 in the nation!